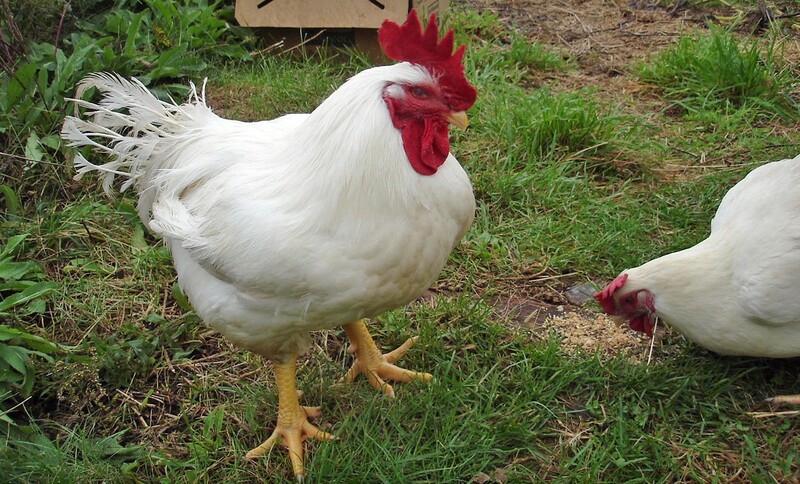 This summer, once again I ventured into raising my own meat… in the form of chickens. 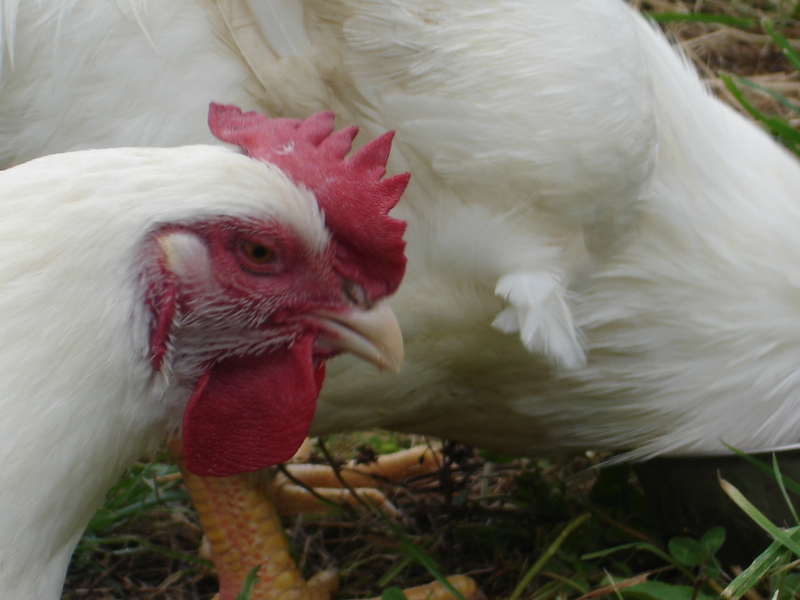 Pastured chicken is above and beyond tastier than anything you could buy at the supermarket. The Meat King is the bird commonly raised for eating, and when you see how fast they pack on the pounds, you know why. The small chicks grew quickly and they were loose in the garden much of the day, foraging for bugs, eating clover, grass and turnip greens. I kept them much longer than most people do, though it isn’t terribly practical or economical to do so. However, mine were slower growing as I didn’t leave the food out for them 24/7, which was also the reason they were good at foraging. A chicken eating greens and bugs must taste better then one who only eats dried grain, it stands to reason. I also fed them cooked rice and porridge mixed with the grain, and fruits, and sprouted mung beans. They were majestic, and some of them actually friendly. Especially one hen. She would come up to me and tug my sleeve or pants leg and look up at me…expecting a treat. I called her Patricia, and when it came time to say good-bye to the others, I decided to keep her, at least for a while. And I also kept a rooster who was a bit of an individual as well. They grew, and then I saw the “King” part of their name, as they were majestic as adults. Few people would ever get to see a full-grown Meat King, and they are a beautiful bird, like living sculpture, so white and stark, with the scarlet comb and wattles. In September, Patricia started to lay eggs, at age of four months, which is way early for a regular bird. I’ve never heard of anyone keeping a Meat King long enough to find out when they would lay. I discovered these birds are not meant to live a long normal life. The rooster, Whipper Billy Watson, injured Patricia while mating with her, his spurs sliced her back open. It was like dinosaurs mating, but more dangerous. I had to keep them separate. In the past couple of months, Whipper Billy is too large now to even make the maneouvers, though he flirts with anyone within range. She also formed a close friendship with my oldest surviving hen, Esmeralda, who has outlived every other chicken, and is around 9 years old. The two became inseparable. Until last night. Patricia died in the night. I think it was of a heart attack (I did an autopsy). She was only six months old. My darling Patricia, she wormed her way into my heart and put a stamp on daily life on the farm here, that won’t easily be forgotten. Her waddling ways, and gentle looks will be much missed by me and all visitors to Turtle Hill. But we still have Whipper Billy to cheer us up.